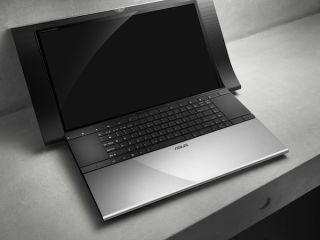 Asus has unveiled its latest Bang & Olufsen designed laptop, the Asus NX90Jq, featuring dual, turntable style touchpads that sit on either side of the keyboard. The Taiwanese computing giant is certainly trying to think differently with the design of its latest mobile computer, clearly taking notes from the cutting-edge designs of Sony Vaio and Apple MacBooks. Asus' latest features a polished aluminium casing and a high-definition 18.4-inch display, in addition to a Core i7 processor under the hood. For audiophile-level sound reproduction, you also get B&O ICEpower speakers, an NVIDIA GeForce GT 334M graphics chip for perfect movie viewing and mid-level gaming and up to (an incredible) 1280GB of storage, should you really need it. All of this is topped-off with a slot-in Blu-ray drive and USB 3.0. No word on pricing, release dates or anything so dreary and practical like that. We've checked in with Asus to find out more about UK release plans, so stay tuned for updates.